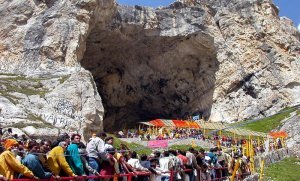 Situated in a narrow gorge at the farther end of Lidder Valley, Amarnath Shrine stands at 3,889m, 50 Km from Pahalgam and 15 Kms from Baltal. 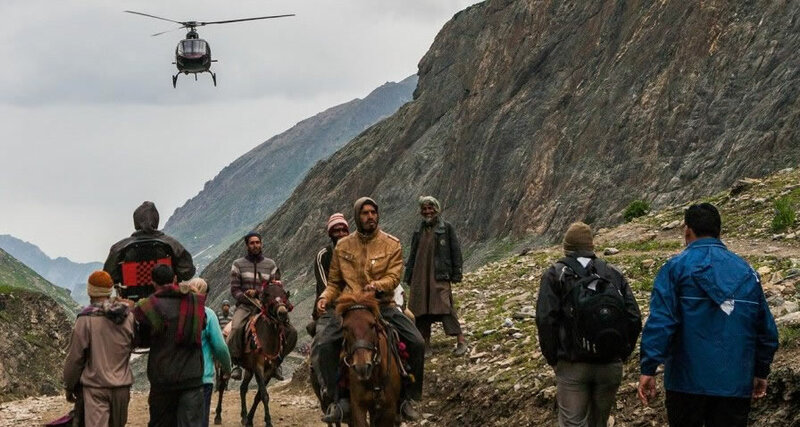 Though the original pilgrimages subscribes that the yatra (journey) be undertaken from Srinagar, the more common practice is to begin journey at Chandanwari, and cover the distance to Amarnathji and back in five days. Pahalgam is 96 Kms from Srinagar by car. Although the existence of the Holy Cave has been mentioned in the Puranas, the popular story narrated by people about the re-discovery of this Holy Cave is of a shepherd Buta Malik. Story goes like this: a saint gave Buta Malik a bag full of Coal. On reaching his home when he opened the bag, to his utter surprise the bag was full of gold coins. This overwhelmed him with joy. He ran to thank the Saint. But the Saint had disappeared. Instead, he found The Holy Cave and the Ice Shiv Lingam there in. He announced this discovery to the Villagers. Then onwards this became a sacred place of Pilgrimage called Amarnath cave/ Holi cave. 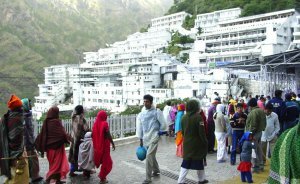 Since then Lacs of devotees perform the pilgrimage through tough terrain and achieve eternal happiness. The Trek to Amarnath in the month of sharavan (July-August) has the devout flock to this incredible shrine where the image of Shiva, in the form of a Lingam, is formed naturally of an Ice Stalagmite which is believed to wax and wane with the Moon's cycle. By its side are fascinating two more Ice Lingams, that of Maa Parvati and of their son Ganesha. Nearest Airport Srinagar Airport ( Baltal is 95 kms approx from Srinagar Airport. Nearest railwaystation Jammu Railwaystation 350 kms approx from Baltal sonmarg. Nearest bus stand TRC Srinagar 85 kms from Baltal sonmarg. Nearest Hotel there is many hotel in sonmarg and Gangangeer Like Hotel Czara Resort, Hotell Rah villas, Hotel Snowland etc. Were to book helicopter tickets ? Download Application form yatra permit/ Health certificate ?